In April 1966 a press conference was held in London at which the imminent arrival of two new offshore stations was announced. These two, Radio England and Britain Radio, were to broadcast from the same ship. “Swinging” Radio England would be a fast-moving Top 40 station; Britain Radio, your “hallmark of quality”, would play sweet music. Both would be staffed by experienced American broadcasting professionals. 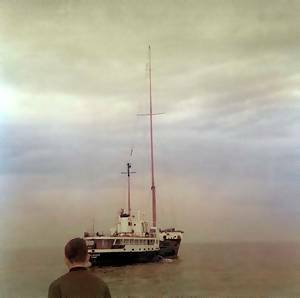 Sure enough, the ship arrived, dropped anchor four and a half miles off Frinton, Essex, and on 3rd May test transmissions began. The mv Olga Patricia, also known as the Laissez-Faire. One of the containers, this one containing the transmitters, being loaded into the ship in Miami harbour. Photo from the Don Pierson collection, kindly provided by Grey Pierson. The man behind these two stations was an American car dealer, the former mayor of Eastland Texas, Don Pierson. During 1964 he had launched Radio London but, by the time the station commenced broadcasting, he had fallen out with some of his fellow directors. Disappointed by the direction Big L was taking, he started putting together a second offshore project, one where he would call the shots. Some £1,450,000 was raised and work began converting a ship, the Olga Patricia. (Despite being referred to in publicity material as the mv Laissez-Faire, it is believed that the ship's name was not formally changed until September 1966. The DJs who worked on her in the early days tend to refer to her by the original name.) 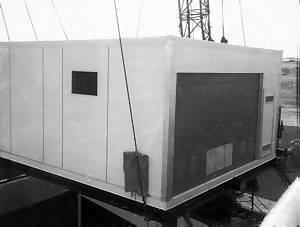 Two studios were installed in a prefabricated containerised section, like a Portakabin. 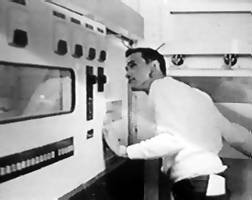 The transmitting equipment was put into another one and both were lowered into the ship's hold. Initially these were not secured so the whole studio would move around in bad weather. The work was carried out as quickly as possible and the ship left for Europe before any disc-jockey sleeping accommodation could be built. Cabins were constructed later but during the early days the broadcasters had to make do with sleeping bags on the floor of the ship's hold. Although the accommodation was basic, the studios were well-equipped and even boasted an automated programme unit. This device could run a station on its own, complete with time-checks and commercials, without the need for a human presenter. It played pre-recorded music on reels of tape with spoken links, commercials and jingles inserted from tape cartridges. 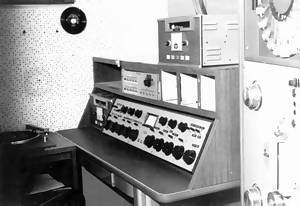 Used mainly for overnights on Britain Radio (the programmes of imaginary DJ “Derek Burroughs”), it was also useful during bad weather. Some of the original DJ team. Left to right: Larry Dean, Brian Tylney, Roger Day, Ron O'Quinn and Graham Gill with Jerry Smithwick at the front. A company called Peir Vick Ltd. was set up to run the two stations, headed by Managing Director Bill Vick. They took over luxurious offices at 32 Curzon Street, just over the road from Radio London. Radio Vision Broadcasts International, part of the well established cinema advertising firm Pearl and Dean, was contracted to look after the selling of airtime. In early May test transmission began for Britain Radio on 227 metres and “Swinging” Radio England on 355 metres. Each of the two stations used a 50 kilowatt Continental Electronics transmitter fed into the 160 ft. aerial mast. 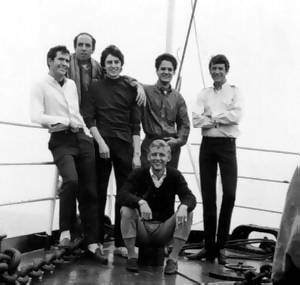 The publicity material claimed that they were “the world's most powerful offshore radio station”. On 3rd June Peir Vick received a complaint that the Radio England programmes on 355 metres were causing interference to the Italian station Roma II. The two stations swapped wavelengths. Britain Radio, now using the offending frequency, reduced its power at night to alleviate the interference. Ron on the radio. Photo kindly provided by Ron O'Quinn. 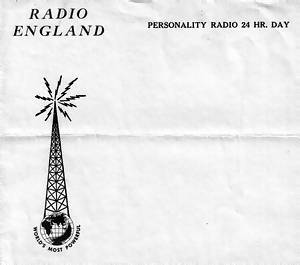 From a sheet of Radio England notepaper, kindly donated by Colin Nicol. The words at the bottom proclaim it the “world's most powerful”. Swinging Radio England and Britain Radio were launched in a blaze of publicity. A star-studded party was held at the Park Lane Hilton Hotel. This event very nearly developed into a riot when hundreds of members of the public turned up. They had heard some ambiguously worded promotions on Radio England and thought they had been invited to the party too. There was also a dispute over the bill. It was not settled until a court order was enforced some six years later. 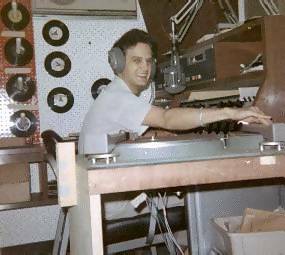 The initial team of disc-jockeys, or “boss jocks”, was made up of Americans Ron O'Quinn, Rick Randall, Jerry Smithwick and Larry Dean, Australians Colin Nicol and Graham Gill and, from Britain, Johnnie Walker, Roger Day and Brian Tylney. None of the British contingent had any previous broadcasting experience. By contrast to the brash Radio England, Britain Radio was very relaxed. Also unique in the UK, this station offered personality presenters playing middle-of-the-road music. Both featured news bulletins. The news was culled initially from a news agency teleprinter on the ship. Unfortunately, as Phil Martin recalls below, the stations' own high powered output caused interference to the teleprinter's reception. One of the two virtually identical studios. A photo published by the Free Radio Association and kindly provided by George Morris. “It was a unique opportunity for me to become the first DJ, or what I now understand in the UK is called a ‘presenter’, on Radio England and Britain Radio. Don Pierson had hired me over the telephone while I was on the radio in Montana, asking me to join up with him in Miami, Florida - nearly 3 thousand miles away - which I did immediately. This occurred while our ship, which was still called the Olga Patricia at the time, was being outfitted with transmitters and studios and being prepared for its voyage across the Atlantic. I spent 3 weeks there, where I also met Ron O'Quinn when he also joined our staff. 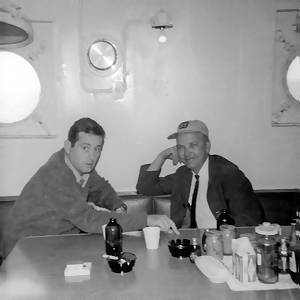 Ron hired the rest of the DJs, while I remained on the ship with Jerry Smithwick as we headed away from the Florida coastline on its historic journey. It would be my guess that he and I may be the only two pirate DJs to actually cross an ocean on board such a vessel. I believe it has been well documented that we lost our antenna when we encountered rough seas, forcing us to take a detour to Lisbon, Portugal for repairs. After a delay there, we finally headed north toward England where Ron and Larry Dean, a.k.a. Frank Laseter, joined up with us, along with the rest of the blokes who made up the original staffs of the 2 stations. Captain Julio Alonzo (left) and Don Pierson on board the Olga Patricia. Photo from the Don Pierson collection, kindly provided by Grey Pierson. One of my first memories in the North Sea, was the realization that pirates had no qualms about not only stealing the airwaves over populated countries, but also stealing from each other as well. It was an enormous surprise to me, just days after we began broadcasting with our Swinging Radio England jingles, to hear the same jingles on Radio London with ‘Big L’ spliced over our name. From then on I understood that there were no rules out there in the English Channel, though for the most part I believe such tactics were generally harmless, and indeed the source of quite a few jokes. Besides the radio stations' crew, there was of course the ship's crew that maintained the vessel, kept us fed, and made sure we were safe at all times. Captain Julio Alonzo was a true gentleman of the high seas who would invite guests into his cabin on rare special occasion to enjoy a sip of cognac. Don Pierson told me once that Captain Julio had originally come from Cuba where he had been a pilot in that country's air force before Fidel Castro came to power. About the time of the Cuban Revolution, he defected to the United States by stealing what I believe Don said was a Cuban Air Force plane and flying to Florida. Seems he was somewhat of a pirate himself and certainly a memorable friend to everyone on board. One of the stories I have told before revolves around the original studios that Mr. Pierson had set up on board the ship, which were designed to operate from an automated tape system. I was fairly new in radio at that time and was not quite sure how such an arrangement would work. When Ron O'Quinn came on board, he immediately did not like the idea of working in a studio set up in this manner and urged that we instead install turntables and a manual operating console in a traditional studio design, which in fact is what we wound up doing. When the seas were rough however, this proved to be somewhat of a problem, which I would guess was also true on some of the other pirate ships. We often had to weigh down the pick-up arms on the turntables, just to keep the needle from lifting out of the grooves of the records when the ship was rocking back and forth. To do this, we often used some of those monstrously large English (old) pennies, sometimes stacking up two or three of them at a time. It didn't always work however and sometimes the needle would literally fly off the records, which of course tended to mess up the songs that were playing at the time. Once when the water was especially rough, I remember being tossed around so much I was literally thrown out of the chair that we used in the studio. 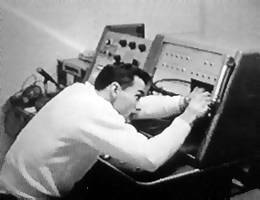 In the years since those experiences, I have seen many radio stations employ the use of tape devices, instead of record (or ‘disc’) playing machines and have often wondered if perhaps we would not have been better off using Don's original studio design, instead of re-wiring everything to suit our personal tastes. Three shots of Rick Randall taken from a television report about Swinging Radio England. Left to right: wiring up the studio, in the transmitter room and on the air. Many thanks to Rick for providing these screen-grabs. The Olga Patricia at sea in 1966. Photo from the Don Pierson collection, kindly provided by Grey Pierson. 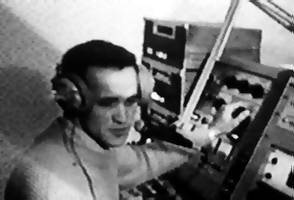 Phil Martin on the air. Photo courtesy of Look Boden. I put in for some holiday leave and never went back to the world of soap flakes and Vesta Instant Curry. (Not until after the Marine Offences Act when Unilever had inexplicably lost interest in me.) From the start it was a giant laugh. 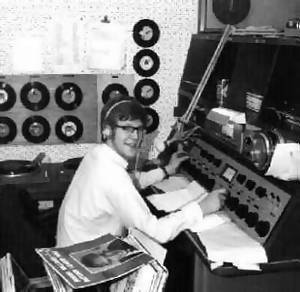 My responsibility, for a while anyway, was Britain Radio, a strange mixture of requests and Ray Conniff and Kay Starr and Procol Harum. No playlist, little experience ... but masses of enthusiasm. And somehow it seemed to strike a chord with a fair few listeners, but sadly not enough A-list advertisers. We were new, we had a pretty good frequency (355 metres) and signal. But, looking back on it, honestly we were a bit of a mess. The Hallmark of Quality? Erm, I think not. 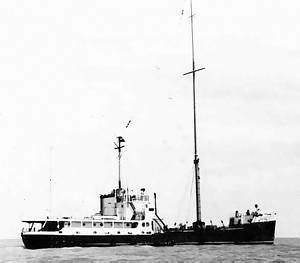 We did have one ‘plus’ over our competitors along side us, Radio Caroline and Radio London. We had a teleprinter which was supposed to bring us the news from the wire services. Sadly, affected by our transmitters, it generated only gobbledygook most of time. So it was back to the old tried and tested method of nicking the news from the Beeb. However, in those days of the Home Service and the Light Programme, there were hours of no news. Only Workers Playtime and A Story, A Hymn And A Prayer and similar fodder. So one Sunday, I am ashamed to admit, I decided to liven things up a little and slipped into the 3pm bulletin: ‘We are getting reports of a jail break in Texas with many dangerous criminals on the loose. More details when we get them’. Later I heard the same story on the news from one of our competitors. I wonder where they got it from! * Phil originally wrote that it was Rick Randall who asked him to become a DJ. Over forty years one's memory can sometimes fail and he now thinks it was Ron O'Quinn, not Rick, who made the initial offer. He has asked us to amend the above. More memories of Swinging Radio England and Britain Radio on the next page.